Flank hernias are lateral abdominal wall defects that occur between the 12th rib and iliac crest. While the majority are believed to be primary, a quarter of flank hernias are incisional and traumatic. Flank hernias are usually located within the superior lumbar triangle (Grynfeltt–Lesshaft hernia)—defined by the 12th rib, lateral border of erector spinae muscles, and medial border of internal obliques—or within the inferior lumbar triangle (Petit hernia)—outlined by the edge of latissimus dorsi, external obliques, and the superior edge of the iliac crest. Preoperative workup often includes CT scan and counseling for preventable comorbidities such as smoking or obesity. Decision making regarding surgical approach depends on many similar factors as ventral hernia repair. Laparoscopic flank hernia repair is performed in a 45° semilateral position with flexion at the hip. The repair involves adhesiolysis, mobilization of the colon, and careful dissection to identify and preserve the ureter, iliac vessels, spermatic cord, and pelvic nerves. Mesh is placed to widely overlap the hernia defect, usually extending to the paraspinous and psoas muscles posteriorly. The mesh is secured with transfascial suture, tacks, and sometimes bone anchors. If possible, the primary defect is closed. Small series show that patients undergoing laparoscopic repair return to daily activities faster than open repairs with no difference in recurrence. However, up to 1/3 of patients report pain, mesh sensation, and/or movement limitation at 1 year postoperatively regardless of approach. 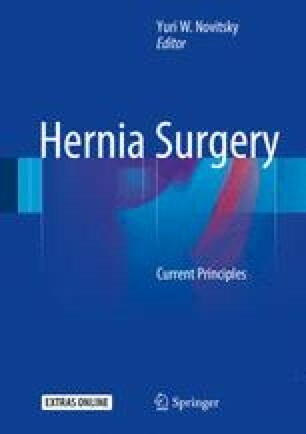 Careful preoperative counseling and planning is necessary before embarking upon repair of flank hernias.